Don’t get us wrong; we love our tailored suits. From our three-piece tweed numbers to our bespoke dinner jackets, there are few things better than pulling on a pair of perfectly-cut trousers and shrugging on a jacket created expressly for us. But here’s the thing — we’ve noticed the recent trend for bespoke overcoats. 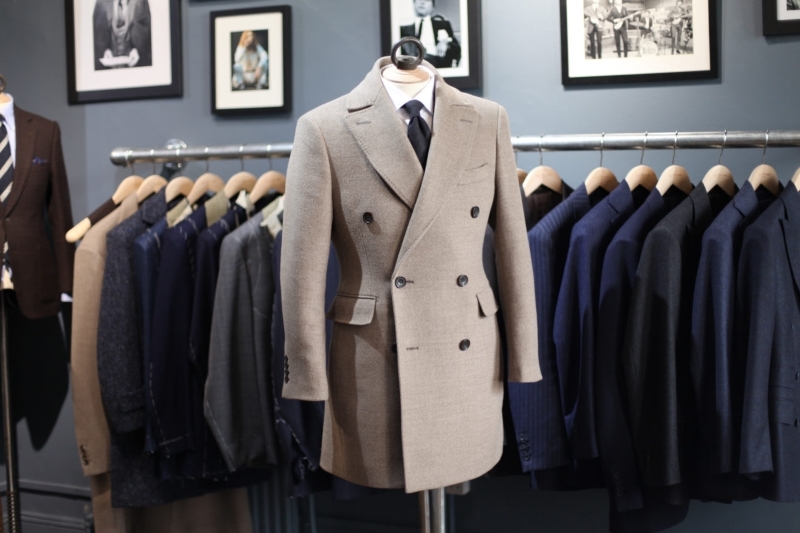 And, while our tailored suits can be worn once or twice a week, a bespoke overcoat can whip your wardrobe into shape each and every day. What’s more, who even sees your suit when you’re on the way to and from the office? No-one, that’s who — because it’s buttoned up snugly beneath your current boxy, badly-cut overcoat. Let’s start with the biggest choice: the material your new overcoat will be made from. Doubtlessly, you’ll be presented with swatch after swatch of fabrics by your tailor. But the key here is to go for something that will pair well with the texture of all your suits — as well as remaining elegant and refined. As with the fabrics above, don’t be wooed by the overly patterned, brashly coloured options your tailor presents you with. If it’s your first tailored overcoat, you want to opt for something that will be easy on the eyes no matter what you’re wearing it with. As such, we’d suggest a block colour — but something with a bit of personality. If your coat is classically-cut (more on that next) then don’t go for a black or navy or grey. Instead try out a bolder blue, a camel or a light stone colour. And the final big choice you have to make — this obviously comes before the finished decisions of pocket angles, button styles and number of vents — is the cut of your overcoat. And the most important advice we have here? Don’t get it too fitted. And this is the big benefit of a bespoke overcoat, says the tailor. Where most off-the-peg offerings lump you with wide shoulders and a roomy waist, these tailored coats act as a way to smooth out your entire outfit — and will make every one of your outfits look made-to-measure.